All natural, no preservatives, made in the USA. 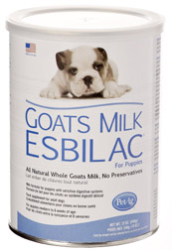 Powder milk formula for puppies with sensitive digestive systems. GME is a complete food source for orphaned or rejected puppies or those nursing, but needing supplemental feeding. Also recommended for growing puppies or adult dogs that are stressed and require a source of highly digestible nutrients. GME is formulated specifically for canines providing a protein, carbohydrate and fat calorie pattern similar to mother's milk. It is fortified with essential amino acids and includes arginine and methionine. GME is prepared with whole goat milk. Powder formula is easy to mix with water.